I doubt many people have noticed, but I’ve been MIA for the past week or so. Due to the hectic pace of the holidays, my blog simply had to wait. I’m going to attempt to go back and recap what’s been going on during my absence, but it will take more than one day to do it! On last Wednesday, 4 days before Christmas, our daughter-in-law, Jennifer’s, aunt got sick. 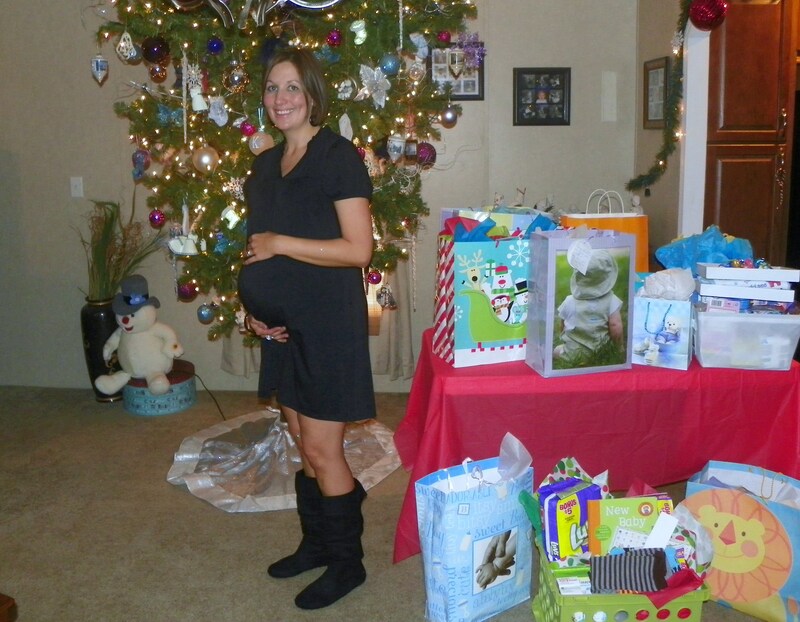 This aunt is Jennifer’s mother’s younger sister–and she was 8 months pregnant. The aunt got sick with toxemia, congestive heart failure, and pneumonia…all at the same time! Long story short, her baby was taken two days later via c-section, and the aunt spent some time in ICU. It was a scary time, leading up to Christmas, for this family. 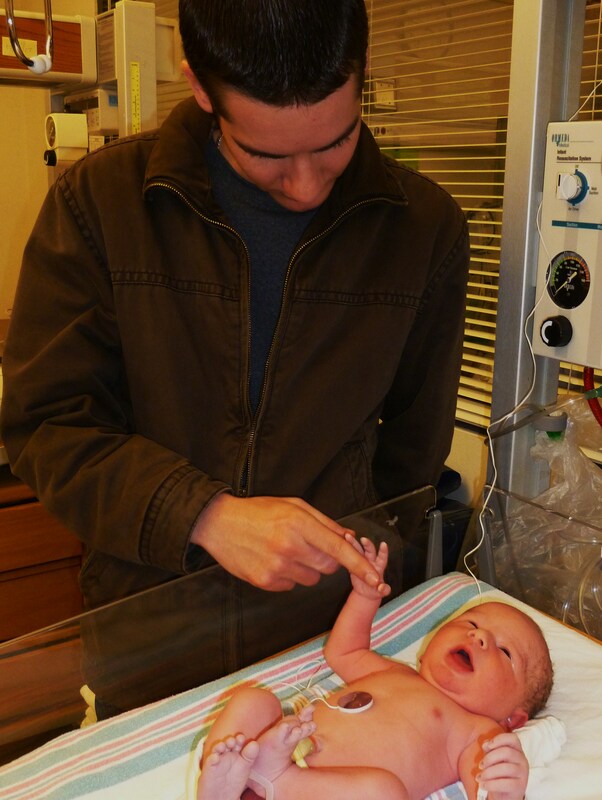 The baby weighed a little over 5 pounds, but he still spent some time in the NICU. Fortunately, the aunt’s health rapidly improved after the c-section, and she was released from the hospital on this Wednesday. As of this writing, the baby is still in the hospital. I forgot to mention that the couple also has a 9-year-old daughter, Emma, who probably just endured one of the scariest and most unforgettable Christmases of her life! 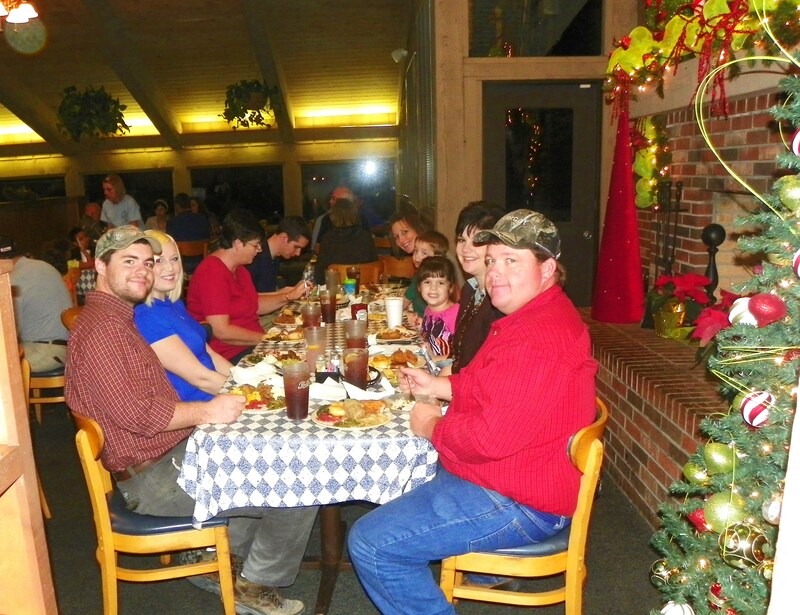 Despite the ordeal with Jennifer’s aunt, on the Thursday evening before Christmas, our entire family was able to meet up after work for a Christmas outing together. This wasn’t an easy feat with 5 people working in five different cities! 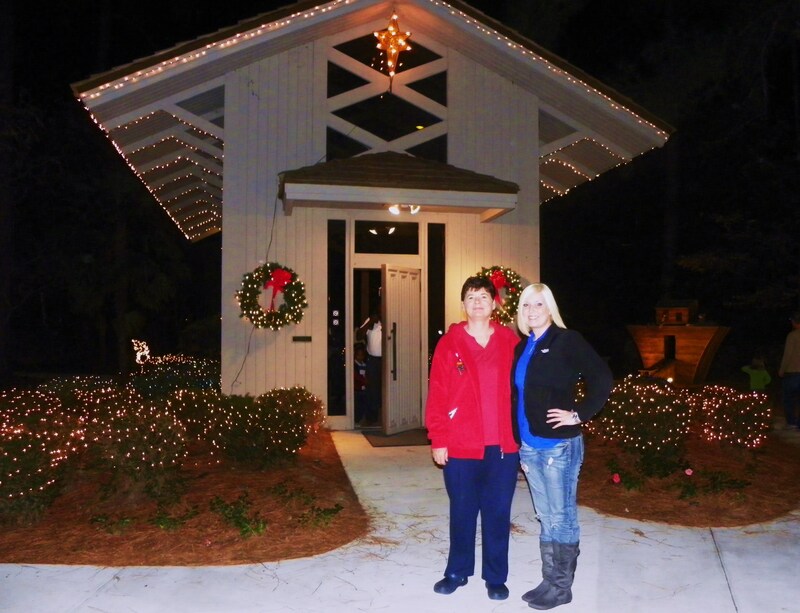 We met up in Metter, GA, ate supper together, then toured Guido Gardens to look at their fantastic Christmas lights. I don’t know what was more enjoyable–the meal or the lights! I love Guido Gardens, and we hadn’t been for a visit in over two years, so I was excited about revisiting. Some remodeling had taken place, and a museum has been added since Mr. Guido passed away in 2009. The museum detailed the history of Michael Guido and his “Seeds of the Sower” ministry. It also included some interesting memorabilia from his career. While the gardens are still as beautiful as ever, it just wasn’t the same without Mr. Guido greeting the guests inside of his little glass chapel…Here’s a photo of Jennifer and me in front of the chapel. An interesting thing happened as our family was touring the gardens. Over beside the little glass chapel, near the replica of Noah’s Ark, I ran into the family that I used to baby sit for about five years ago. Those twin baby girls sure have grown since I left them back in 2007! It’s hard to believe that I used to rock them and change their diapers! I stopping babysitting the twins so I could stay home and enjoy our granddaughter, Madison, more often. All three girls have grown a lot since those days…See what I mean? 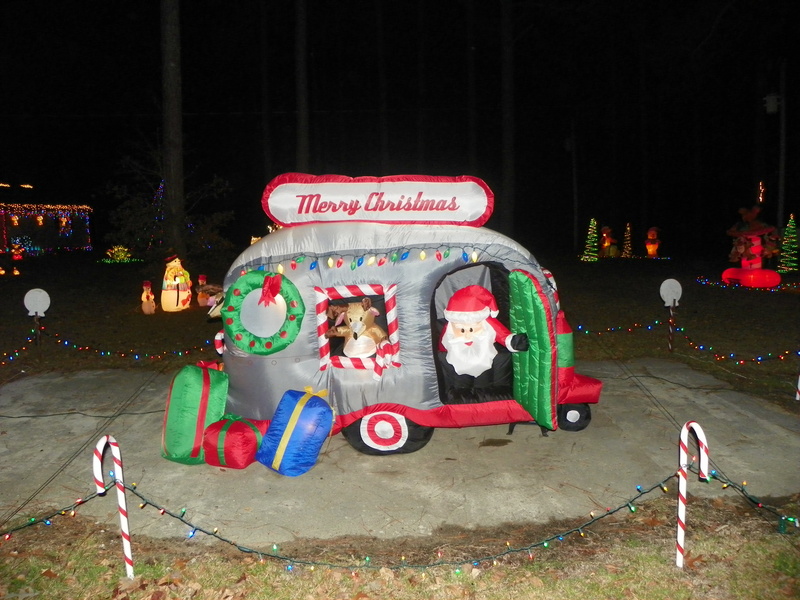 On the way home from Guido Gardens, we stopped by a place we refer to as “Santa’s House”. 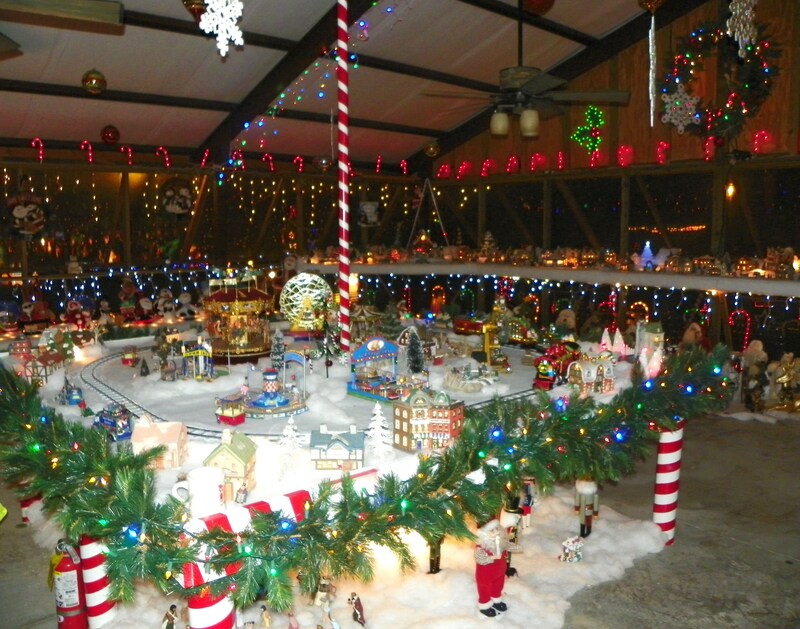 This place is a “wonderland” of all kinds of Christmas decorations and lights. On the three days leading up to Christmas you can visit with Santa–and take all of the pictures you want–for free! We enjoyed the lights and decorations, but granddaughter, Madison, wasn’t in the mood to visit with Santa. She steered clear of him! 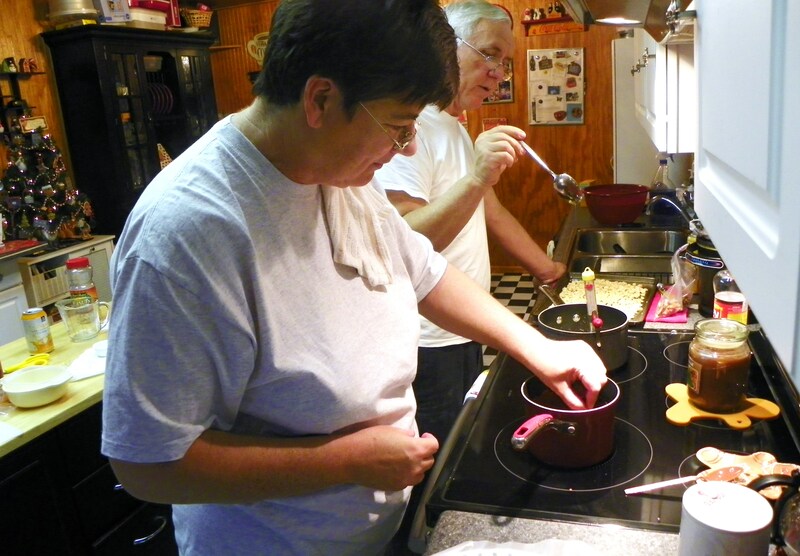 Thursday and Friday before Christmas were spent in the kitchen–making candy! I didn’t get to make any last year because I was sick with the flu, so I had to make up for lost time this year! Ed was off from work, so he joined me in the kitchen. I made fudge and buckeyes, while Ed made peanut brittle. The first batch of peanut brittle didn’t turn out, and ended up in the trash can. After that, we tried Paula Deen’s recipe for “Nutty Brittle” which turned out pretty good. She didn’t say to stir the nuts while they were cooking, so we didn’t. We almost had a disaster with scorched nuts…If you ever use Paula’s recipe–stir those nuts! We also tried Paula’s recipe for divinity. We were so close…but didn’t quite get there. Our divinity wasn’t divine! Our balls didn’t harden! I think we should’ve cooked the syrup about 1 more minute! Would you believe that we used 4 cups of sugar and 5 cups of pecans in that candy! Wow! On that note, I think I’ll end this post! I’ll be back another day for Christmas Catch Up part two…Have a great weekend, everyone, and a Happy New Year! 1. Share something you loved about your Christmas Day. Watching my grown sons act like kids again! It brought back such happy memories. 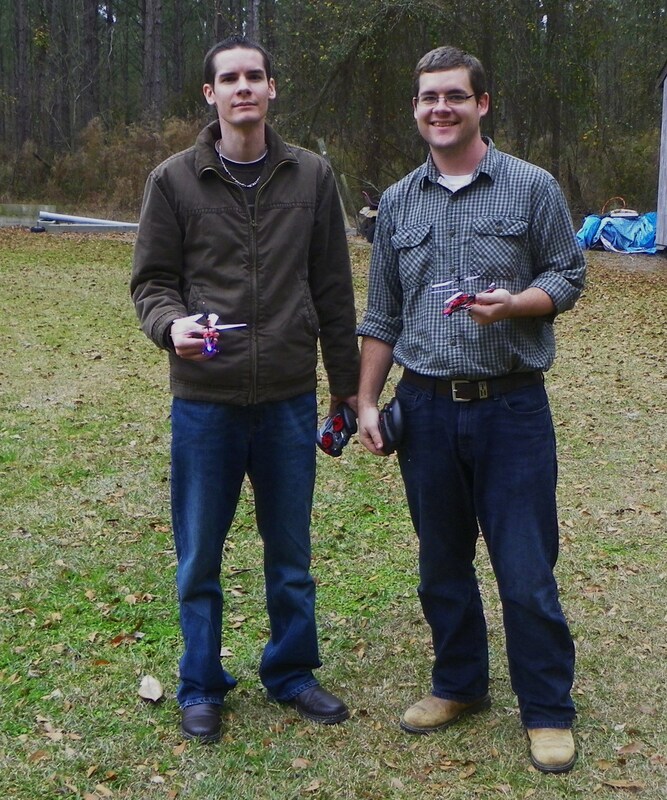 Our sons, ages 29 and 26 were jumping on the trampoline and flying remote-controlled helicopters like they were 10 again! I think they had as much fun as our grandchildren did, and I’m glad. It’s good to feel like a kid again. 2. You get to put five items in a time capsule to be opened in 100 years, what items would you choose and why? A cell phone, an iPad, a People magazine, a local newspaper, and a family photo album. I’d put in the cell phone because so many people seem to be obsessed with them these days (a phenomenon which I do not understand). I’d add an iPad because it’s today’s newest, most popular technology(and I’ve never seen one). The magazine, newspaper, and photo album would be for historical purposes. I’m sure somebody would enjoy looking at the news, prices, and styles of the today. I wonder what the price of a loaf of bread or a gallon of gas will be in 100 years??? 3. What do you like on a cracker? I’m not much of a cracker eater, I usually skip them and go straight for sweets! I used to eat peanut butter on Ritz crackers though. 4. Do you make resolutions at the start of a new year? How’d that work out for you this past year? I stopped making resolutions a long, long time ago. Who really cares anyway? 5. What’s a song or song lyric you’ll associate with 2011? “Knee Deep In Paradise” by Zac Brown Band because it reminds me of the fantastic 39th wedding anniversary that Ed and I spent at the beach in 2011. I’m still dreamin’ of taking a cruise one of these days…or at least traveling deep into Florida to see some beautiful blue water. 6. How will you ring in the new year? Ed and I usually just hang around the house and quietly watch the new year come in together. 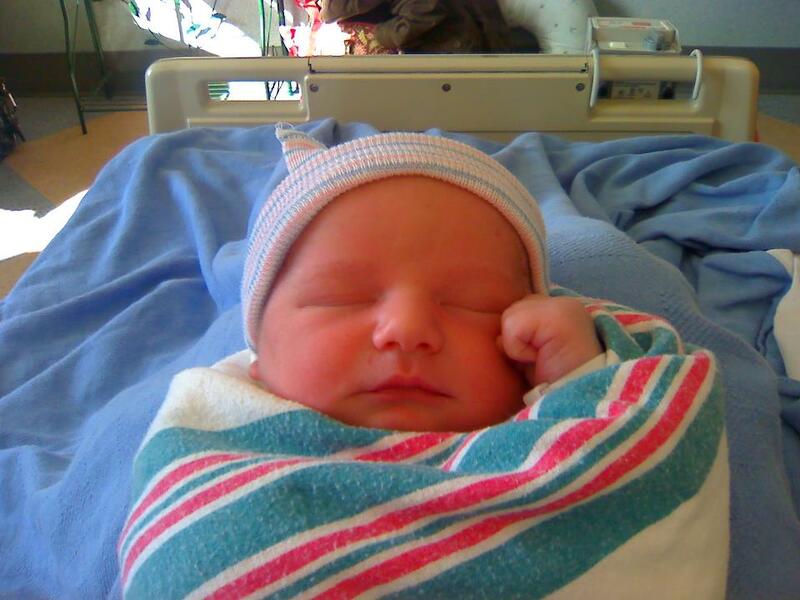 Random: Announcing the arrival of the newest member of our family…grandson, Chase Walker! Chase was born on Tuesday, December 27 at 9:45 am. He weighed 7 lbs, 10 oz and was 21 1/2 inches long, and of course we think he’s beautiful! Chase is the son of our oldest son, Brett, and his wife Christina. While Ed and I were standing at the nursery window admiring our newest grandchild, a nurse came up and asked if it was our first. I said, “No, our third!” She said we were staring with such amazement that she thought it was our first! I said to her “It never gets old”–and it doesn’t! Welcome to the family, baby Chase! T’was just days before Christmas…and all through the house…everyone was scurrying–including Joyce, but she took the time to post today’s questions and host The Hodgepodge! Now that’s what I call dedication! Thanks, Joyce! Now, the rest of us need to answer the questions, then make our rounds visiting other participants! 1. Are you cooking Christmas dinner? How many will be round your table this year? What are we having? Yes, I am cooking. I’ve cooked every Christmas dinner for over 20 years. That’s a lot of hams and turkeys! If the good Lord is willing, we will have ten around our table. Jennifer has to work, unfortunately. Baked ham is on the menu. 3. Santa likes a glass of milk with his cookies. Do you? What kind of milk is on tap at your house-skim? almond? soy? full fat (Gasp!) Just last year I finally gave in, and switched to 2% milk. I refuse to compromise any more than that! 4. Time magazine recently named their ‘Person of the Year’ for 2011. This is the person the editors believe had the greatest impact, for better or worse, in the past year. This year they chose ‘The Protester’. Your thoughts? Who would you name Person of the Year for 2011? When I heard this news, it made me ill! All this bunch of people did was make a mess and cause trouble for others–and they got paid to do it! How about we shine the spotlight on the police officers or small business owners who were having to deal with the “crap” of the protesters, rising crime rates, or a lousy economy this year! 5. December 21st is National Flashlight Day… when was the last time you needed a flashlight and did you know right where to find one? I use a flashlight regularly, to check on my cats outside, so I keep my flashlight beside the door. 6. Candy canes…yum or yuck? I can take or leave them, so I’m going to say yuck. 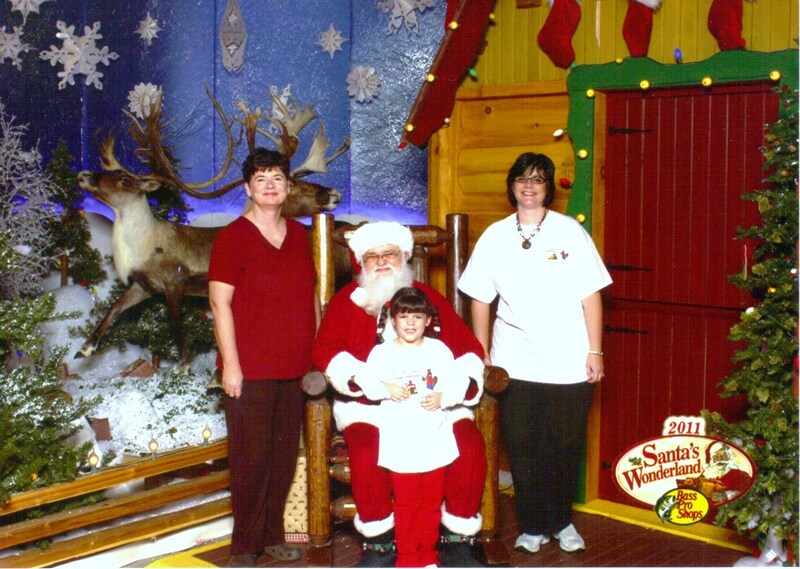 Random: On the Field Trip last Friday, Brandy, Madison, and I decided to have our picture taken with Santa Claus. It was the first time that I ever remember having my picture made with Santa! Better late than never, right? Let me begin by saying, “I love Christmas decorations!” I always have. 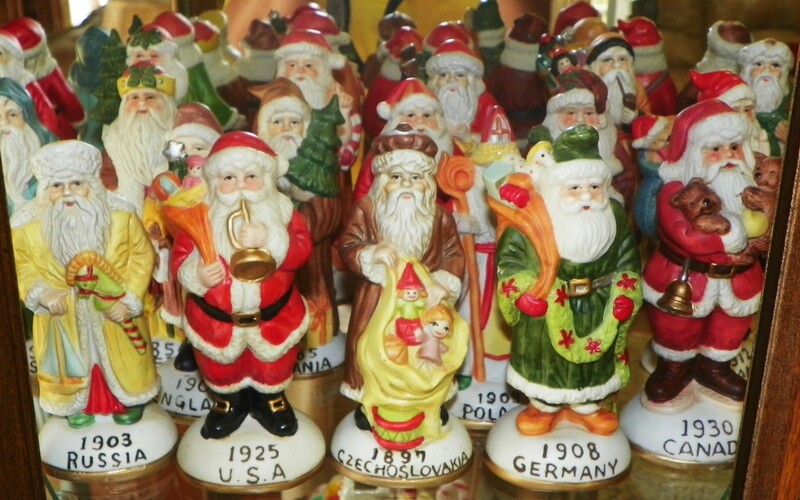 I began collecting decorations way back in 1972, and although I’ve slowed down quite a bit, I’m still collecting. By decorations, I mean all things Christmas–anything that strikes my fancy. As you can imagine, some of my collection is getting old, and many things that used to be animated, have begun to fail. I was sad this year, when the large skating pond Ed bought for me many years ago, finally stopped working. 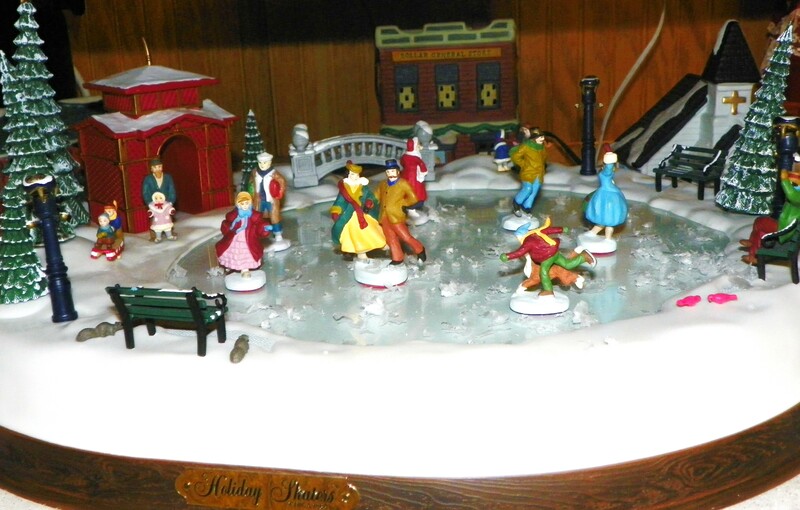 I found pleasure, many years, from watching those little figures gliding across their “frozen pond” while holiday music played. The old train bit the dust this year, too. Once I finally got enough new batteries for it, I was going to give it to our grandson to play with. As hard as Ed tried, he couldn’t get the old train to work. I was going to throw it out, but Ed couldn’t stand to let it go…it’s in his work shed! 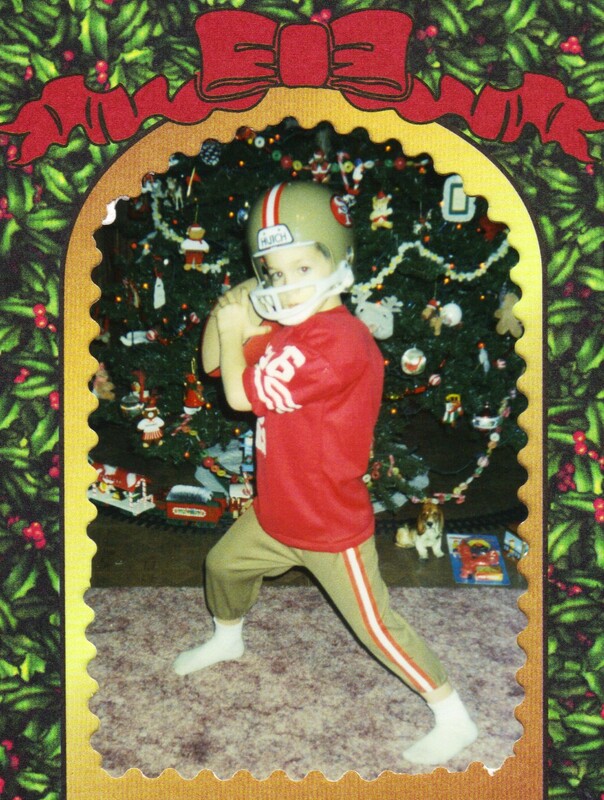 If you look close, in the old photo of Brad below, you can see the old Christmas train under the tree. This photo is about 19 years old. Some of my favorite Christmas decorations remind me of my mama because I purchased them from her while she was an Avon salesperson. All of these decorations are getting pretty old, too. 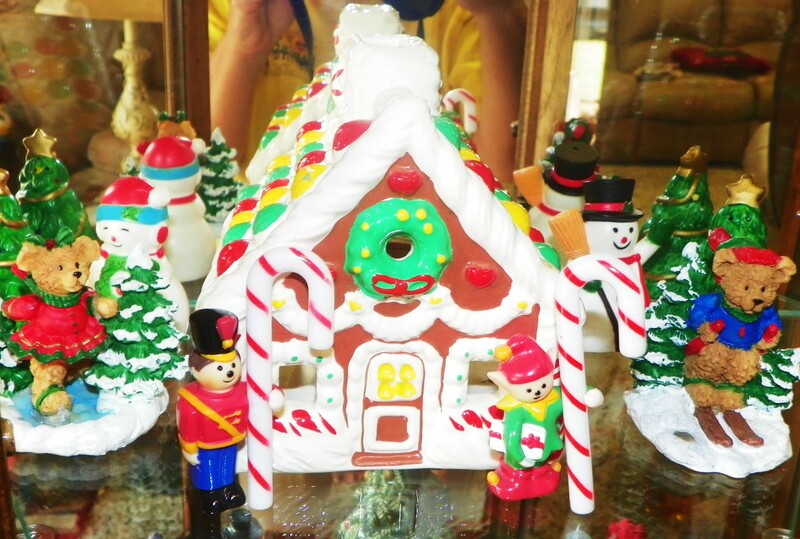 Here’s a gingerbread house that I got from mama. The house has a candle inside of it, but I’ve only lit it once or twice. These days I keep it inside of my curio cabinet during the Christmas season. Many of those little decorations surrounding the gingerbread house are gifts from former students. I bought this ceramic Christmas tree from mama, too. It has scented crystals inside of it to make the room smell like a Christmas tree! 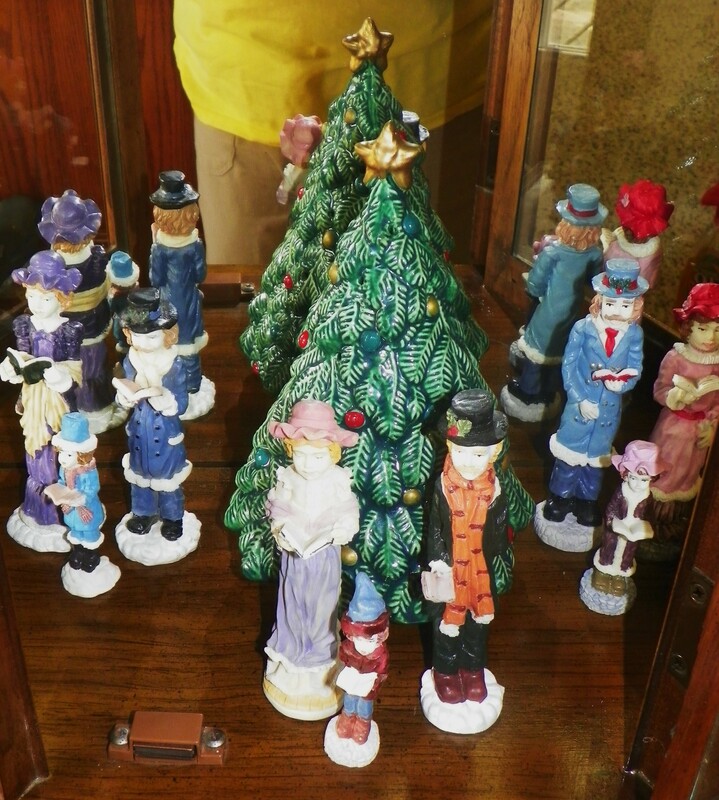 The little carolers surrounding the tree, I collected from a dollar store one year, simply because they reminded me of some people from our church–the choir! Last, but not least, are my Santas From Around The World. I saw these one Christmas and just had to have them. The only problem was, by the time I saw them, the store was already sold out of USA and Germany! I bought the rest of the set anyway. Meanwhile, without my knowledge, Ed was searching high and low in all of the surrounding stores to find the USA and Germany pieces. He found some in Savannah, and drove 120 miles, round trip, to get them for me. I still can’t believe he did that! Wow, I’m just getting started, and my word count tells me it’s time to wrap things up, so I’ll stop. Perhaps I’ll do a “Favorite Things Part 2” sometime. For now, I’m off to wrap the rest of those Christmas gifts! 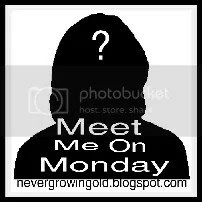 Meet Me On Monday…The Christmas Countdown! 1.Wrapping paper or gift bags? I use both, but I use more wrapping paper than bags. 4.When do you take your tree down? I begin taking decorations down a day or two after New Year’s Day. 6.Do you have a nativity scene? Yes, actually I have more than one. 8.Favorite Christmas cookie? Fruitcake cookies or frosted sugar cookies, can’t decide which. 9.Where will you eat Christmas dinner? At home, I’m cooking for the family. 10.Angel, bow or star on top of your tree? None of the above, we have a Boyd’s Bear on top of the tree because it’s the only thing that fits. 11.Most annoying thing about this time of the year? The crowds! 12.Do you like Fruitcake? Not really, but I do like fruitcake cookies. 13.What are you most excited about the holidays? Playing Dirty Santa with our children, and seeing the grandchildren playing with their new toys on Christmas. 14.Do you open presents Christmas Eve or Christmas Morning? On Christmas Day, after lunch. 15.Will you still be wrapping presents on Christmas Eve? I sure hope not! Weekend Wrap-up: Our weekend didn’t go exactly as planned…Brad and Jennifer’s party was cancelled. Jennifer came down with a case of “Christmas Crud”! You know, sore throat, fever, laryngitis…it was bad, but at least it’s not the flu! She went to the doctor on Thursday, and she is finally feeling better today. On Thursday evening, Ed and I attended the Christmas Party at The Griffin House, where his mama is a resident. I was so proud that every one of our children and their families (except Jennifer, who was sick) came, too! I’m pretty sure that Ed’s mama had the most family present at the party! Friday I accompanied my daughter and granddaughter on a Field Trip to Savannah. After the activities of the Field Trip were over, we did a little last-minute shopping. The crowds weren’t bad at all in the beginning, but by the time we were leaving…oh. my. word! On Sunday we did a few things around the house, and just relaxed. I enjoyed the calm before the storm of activities that will be coming this week! Later, Brad and Jennifer, and some old and dear friends of ours came by for a visit on Sunday afternoon, and we enjoyed visiting with all of them. I’ve spent a lot of time rummaging through old photos this past year. I made a book on Shutterfly using a lot of those photos, then gave it to Ed’s mom as an early Christmas gift. This week I decided to make a video montage with some of the photos, in honor of Ed’s dad. Today I’m sharing that video with you. What is it about getting older that makes us so nostalgic? Have you ever noticed how older folks only like to talk about the past? My parents did this, and Ed’s did, too. When I was younger, I couldn’t understand why they seemed to enjoy remembering the past so much, but lately I’m beginning to “get it”. This video montage recaps life with the Bacon family, especially Ed’s parents. It begins with photos taken in the 1940’s in front of the home which the couple shared for over 50 years. It shows all five of their baby boys, two of which never lived to grow up. It shows pictures of the family farm where we continue to live today, too. You’ll also see Ed, while he was growing up with his two younger brothers, us during our courtship, Ed while he was in the army, me spending time with his family while he was away in Okinawa, and us with our parents on our wedding day. The montage goes on to show some fun family times throughout our lives, and holiday times with each other. There are several photos showing my parents, and Ed’s parents together. Our families were close, and we had lots of good times together. Is anyone else feeling like time is running out? So much to do, and so little time…I’ve cut my “to do” list down to the bare minimum, and I still can’t seem to get everything done. I did manage to get about half of the Christmas presents wrapped yesterday. That’s about all that I got accomplished. It was one of those days when I couldn’t stray too far from the bathroom, if you get my drift…Since I wasn’t feeling my best, while I was wrapping the presents, it seemed like all of the Christmas music playing on the radio sounded sad. Of course, that could be because songs like “Christmas Shoes” and “Christmas Carol” were playing! What the heck? I could have used a blast of “Run Run Rudolph”! One funny thing did happen yesterday. The phone rang and I answered it. My daughter was on the other end, and she said “Look out of the front door!” I looked out, and what I saw made me laugh out loud! Brandy was just driving into the yard, and attached to her mini van was a large set of antlers and a big red nose! She was driving a reindeer van! I wanted to take a picture, but she drove away before I got the chance. I also got a nice surprise when Ed brought in the mail yesterday. 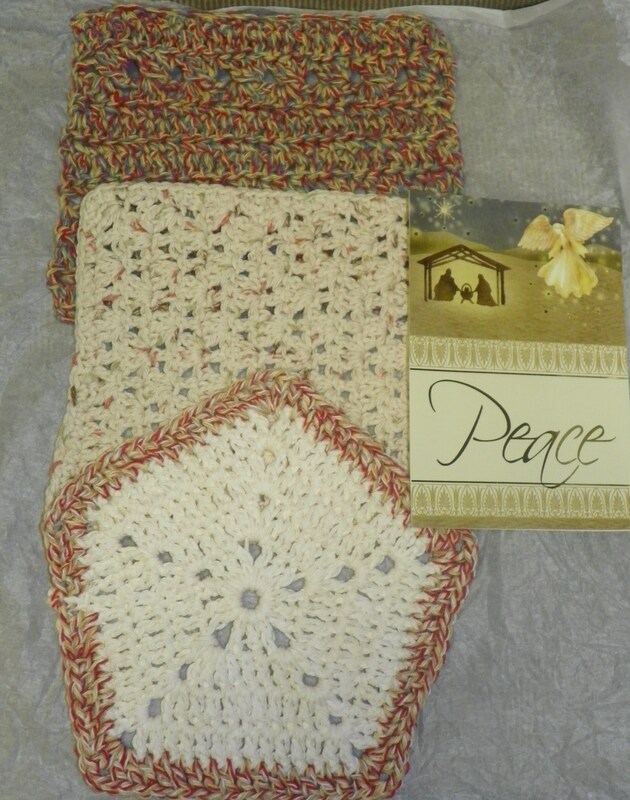 I received a lovely gift of three handmade (crocheted) hot pads from blog friend, Sammie, aka “Mama Bear”. This sweet and thoughtful gift was part of a “pay it forward” challenge that Mama Bear issued, and I accepted about a year ago. I love my gift, and will think of my friend whenever I use them. Thanks, Mama Bear! On Saturday night, Jennifer and Brad are hosting a little family Christmas get-together at their house. They are currently living in Ed’s mom’s house, and it’s a home that’s made for entertaining, with its gigantic “sunken” den. 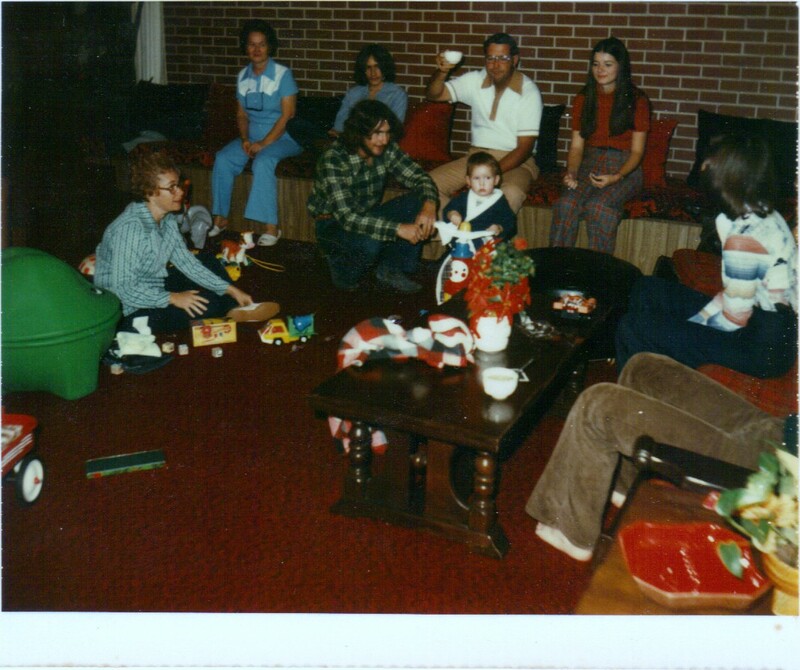 one of the many family Christmases held in that "sunken" den...cir 1975 That's me in red! By sunken, I mean you have to step down into it. Remember when that was stylish? I love that den! I once sat on those steps as a young girl, (before it became a den, it was a carport) and watched a young Ed working on his car! Anyway, I’m looking forward to a party in that den, as I’m sure it will remind me of some good times…Ed and I even had our wedding rehearsal dinner in that den! I’m going to get my hair cut today, then back home to attempt to finish my gift wrapping! At least my stomach seems to be better, thank goodness. Let’s hope I can find some “happy” music on the radio today, too! It’s mid-week, which means it’s time to take a little “hodgepodge break”! If you aren’t already doing so, and would like to join along, please feel free to click Joyce’s cute little button and jump right in! Thanks to Joyce for these wonderful questions this busiest time of the year! 1. 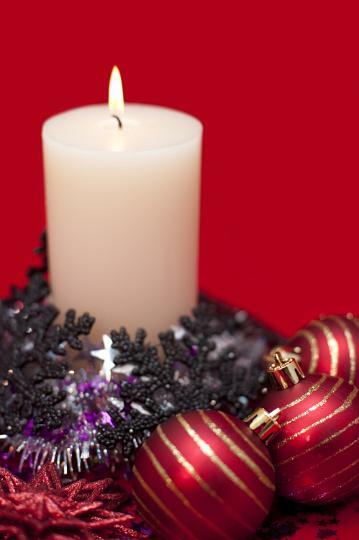 Do you put Christmas decorations in every room of your house? If not every room, what rooms do you decorate? Oh my goodness, YES! I love Christmas decorations! We five Christmas trees of various sizes–including one in the bathroom. We have a main tree, a kitchen tree, a coca cola tree, and two mini trees. 2. If you could visit one of the Nordic countries (Denmark, Finland, Iceland, Norway, and Sweden) which one would you choose and why? I honestly have no idea! I’ve never had the desire to travel outside of the United States–except to go on a cruise to some islands somewhere. 3. What does the word faith mean to you? I remember once hearing someone say, “Faith is believing in something that you can not see.” That definition stuck with me, and I’ve never forgotten it. I can’t think of any better way to describe faith, except to say, faith is what keeps me going and carries me through, especially through the rough times. 4. You can go back to your childhood for one day…what day and age would you choose? I wasn’t technically a child, since I was 17, but I’d go back to May 27th, 1972, the day I went with Ed’s parents to pick him up from the airport. Ed had been gone overseas for almost 21 months without a furlough. We’d shared one short phone conversation in all of those months! I can’t begin to tell you the feeling of boundless joy and exhilaration I felt that day when I finally saw my Ed again, and actually got to touch him! It was pure bliss, and I’ve never forgotten the feeling! 5. When did you last have ‘punch’? If it’s not too much trouble share your favorite punch recipe. I actually had punch last Saturday at our daughter-in-law’s baby shower. My recipe is a simple one– 1 large can of orange juice, 1 large can of pineapple juice, an 8 oz. bottle of lemon juice, 4 cups of sugar, and 4 quarts of water. The original recipe calls for 5 cups of sugar, but that’s too sweet for me, so I decreased the amount. 6. Do you fill stockings at your house? Are stockings opened before or after the bigger gifts? One year (1976) I crocheted every member of Ed’s family a stocking. For a long time Ed’s mother filled the stockings for the Christmas gatherings at her house. The adults enjoyed the stockings as much as the gifts, I think. This was in the days before the grandchildren came along. Once the grandchildren began arriving, we stopped filling the stockings for adults, and concentrated more on the children. When our children were growing up, I always filled their stockings with Christmas candy, and maybe a couple of small other items. They opened their stockings later in the day, or sometimes the next day. This tradition went on for quite a few years. Sometimes Ed and I got something in our stockings, sometimes not. These days it’s “not”. 7. What takes your breath away? Childbirth! What a miracle it is! (I secretly think I would have made a great OB nurse) I was just as amazed by the birth of child number three as I was with child number one. Now that my babies are all grown up, I’ve been blown away by each of our grandchildren’s births! What tiny miracles they are…To go from only an embryo, to a precious tiny baby in just 9 months! Only twelve more days until I get to meet grand-baby number three! Speaking of grandchildren…I can’t help but have a particular family on my mind this holiday season. I’ve been meaning to blog about them, but somehow never did. Warning!…this is tragic and very sad. In late October, our town was shaken when one of our most loved families was struck by tragedy. Janis McCurdy, former council woman and local business owner, was involved in a head-on collision. Riding in the vehicle with Janis were three out of four of her son’s children–her beloved grandchildren! The oldest, eleven year old, Turner, was critically injured, but survived. The other two children, two-year-old, Spencer, and seven-year-old, Molly, died at the scene of the crash, along with their grandmother. Fortunately, four-year-old, Anderson, was sick and was not in the vehicle at the time of the accident. Janis was being a dutiful and loving parent, and was babysitting because her daughter-in-law was sick in the hospital at the time. She was returning from picking the children up from school when the accident occurred. Meanwhile, two brothers, Jose and Pedro, ages 22 and 24, and new residents to our town, were driving the other vehicle involved. They were returning from inquiring about a new job, when their vehicle crossed over the center line. Janis swerved to miss them, but they counter-swerved and the two vehicles collided head-on. Both of these young men were killed at the scene, too. I can’t help but think of all of the families affected by this one tragic accident. 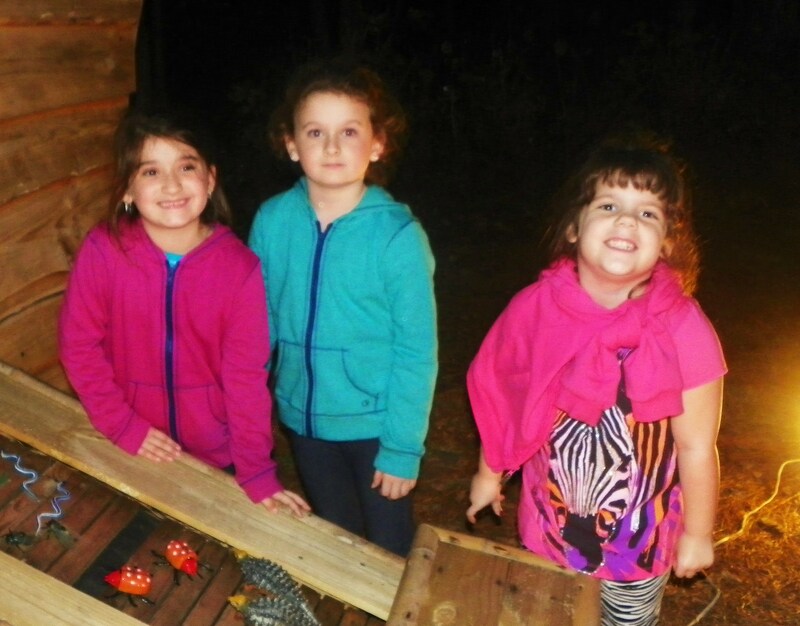 A husband left without a wife, and missing two of his grandchildren. A young married couple, with the husband losing his mother and two of his four children at once. The other family missing two of their sons, struck down in their prime…It’s almost over-whelming to think about what these families must be going through. I can’t imagine…but for the grace of God, it could be me. Yesterday, several people left comments about the upside down Christmas tree in this photo. The tree belongs to our daughter-in-law’s sister. Some of you had never heard of an upside-down tree, while others were curious, or perhaps a bit intrigued like me. 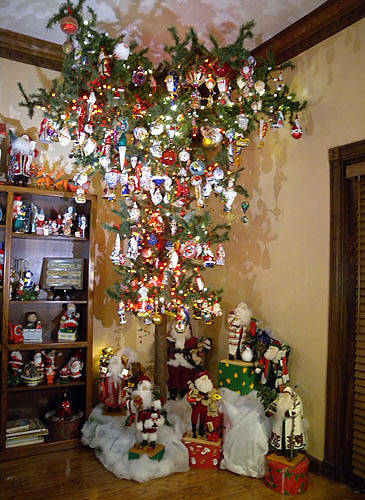 You may be surprised to hear that the upside-down tree is one of the hottest new fads! Actually, upside-down Christmas trees aren’t so new though. Hanging fir trees upside down goes back to the Middle Ages, when Europeans did this to represent the Trinity. Who knew? Since a traditional Christmas tree is usually displayed with the top of the tree pointing toward heaven, some people think the upside-down tree is disrespectful or sacrilegious. Actually, upside-down Christmas trees were originally introduced to retailers for in-store displays so more ornaments could be displayed at eye level to potential customers. The upside-down tree also left more room underneath the tree for storing extra stock underneath. While some may not care for the unusual upside-down tree, it actually has some benefits that a traditional Christmas tree doesn’t have. The ornaments hang higher, keeping them safe from small children. Pets also won’t be able to knock ornaments off the low limbs of your tree–and there’s lots of room underneath to stack Christmas presents! Christina’s sister’s tree is artificial, and it has a trunk that it rests on. She has two little boys, ages 2 and 4, and also runs a daycare in her home. I suppose this style of tree might work best for her, or perhaps she just likes the oddity of it. I really like it too, although I’m too traditional to ever have one. Well, it’s official! I’m an old poop. I decided to bake some refrigerator cookies on Monday afternoon. You know, the kind you buy in the grocer’s refrigerated section. Well, apparently my eyes are failing me, because I read the directions and thought it said to bake at 325 degrees for 45 minutes. (I thought, 45 minutes for cookies?) but I went ahead and followed what I thought were the directions. Needless to say, after a while I began to smell something burning…it was my cookies! I opened the oven door to find 12 very brown cookies, and 10 minutes still left on the timer! After taking a second look at the package, I realized it said bake at 325 degrees for 15 minutes! Ha! Nothing like a crisp, brown cookie! Got milk? If this wasn’t proof enough that I’m an old poop, I did another crazy thing! After lunch on Monday, I thought I sent my husband an email at work. I was telling him that I went to see his mama, and that I needed him to get two of my prescriptions refilled. When he arrived home from work, he said he hadn’t received my email. On Monday night, the phone rang and it was my sister-in-law calling from Florida. She said “Am I crazy or are you?” Then she went on to tell me that she had received an email from me saying “Hey, I visited your mama today. Could you please get my prescriptions refilled?” Yep! You guessed it, I sent Ed’s email to my sister-in-law! Boy did we get a good laugh out of that one! Actually, a while later, I think I figured out my problem! I think it was caused by being woke up at 3 am by my cat who was sleeping outside when suddenly it began to rain. Bobs, the cat, doesn’t handle rain very well. So I ended up spending the rest of the night on the couch, in an effort to keep the cat out of the rain–and out of my bed! Hopefully, tonight will be a better night–not a cloud in sight! Update ~ Bobs rested well, which means I rested well. The internet didn’t fare as well. I’m just now able to get a connection and it’s after 12 pm on Tuesday. 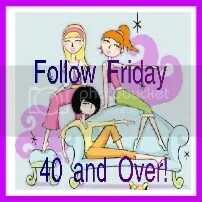 Sorry for the delay in posting!! !